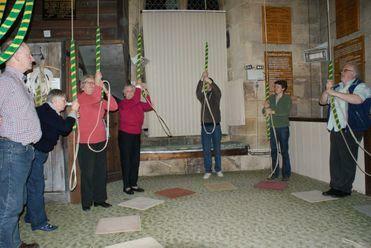 St. Swithun's has a strong band of bell ringers who meet every Wednesday evening from 7.45-9.30pm, and ring for our Sunday service from 9.25-10.00am every week. Divisional 8/10 bell practice takes place every fourth Monday of the month from 7.30-9.00pm, and ringing may take place on Sunday evenings by arrangement. All visiting ringers are welcome to practices on a Wednesday evening and to Sunday morning service ringing. Visiting Bands are also welcome - church services and weddings permitting. Please contact the Secretary if your Band would like to ring at St. Swithun's. New ringers are also always welcome to join the band, normally from the age of 13 upwards. Our Tower Captain will be pleased to talk to you about how to learn to handle a bell. The Bishop of Horsham dedicated the 12 bells on 9th November 1985. The twelve bell peal, the first in Sussex, marked the centenary of the Sussex County Association of Bell Ringers. In actual fact the fine tower of St. Swithun's contains 13 bells, the sharp second allowing for greater flexibility in ringing. The original eight bells were installed in 1813 but necessary restoration work in the late 1970s and early 1980s resulted in the opportunity being taken to augment to ten bells. This normally expensive exercise was made possible by fundraising, covenanting and grants. In 1981 the bells were ordered from the Royal Eijsbouts Foundry in the Netherlands, with fittings from Eayres and Smith. The local ringers removed the old bells, frame and grillage and did much of the hard work to enable the work to be completed at the minimum cost. Click here to Watch a brief video of the bells arriving at St. Swithun's in 1982. There was much celebration in 1985 when the three new front bells were added to augment the peal to twelve bells. Luckily, the tower is big enough to take the extra bells. Again the ringers provided much of the labour for the work to be carried out and their work is a legacy for which we must all be grateful.